To which church era did Jesus say "You are neither cold nor hot." 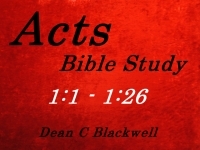 Well if you will turn over to the 1st chapter of the book of Acts, we want to begin with what it says and what it doesn't say. The Acts of the apostles' "The former treatise have I made, O Theophilus, of all that Jesus began both to do and teach," so of course he wrote the book of Luke, and of course the writer for the book of Acts has to be one of the writers of another book in the Bible because how else would he tell you "the former treatise have I made"? So, you'll see as you go on in the book that it is Luke who wrote the book.